Maybe it is because I'm pregnant (23 weeks!) and this little baby is starting to kick me pretty ferociously, but this post I wrote back in 2008 has been on mind. I thought I'd share it again since it was one of my first posts. Our lesson in church today was on the Second Coming of Jesus Christ. As my husband and I were walking home after church we got into a discussion about if the prophet will know when Christ is going to come again. He mentioned the scripture in Mark 13: 32 that says, "But of that day and that hour knoweth no man, no, not the angels which are in heaven, neither the Son, but the Father." Meaning that no one knows when the Lord will come again, not even the angels in heaven. But then I mentioned the scripture in Amos 3:7 that says, "Surely the Lord God will do nothing, until he revealeth his secret unto his servants the prophets". Meaning that God doesn't do anything without first revealing it unto his prophet on the earth. We discussed these scriptures for awhile, but I wasn't feeling satisfied with any of the conclusions we came up with. I felt certain, deep down in my heart, that God's prophet would know when Christ was coming. When He came for the first time several prophets knew when he was coming, Samuel the Lamanite even knew the exact year. Mary and Joseph had an angel appear to them who announced His coming. Ding, Ding Ding! An answer came to me. Mary knew that Jesus was coming. Both her and Joseph had been visited by an angel and she had been overshadowed by the Holy Ghost. When she conceived a child, she knew that she was carrying the Son of God. There could have been no doubt in both Mary and Joseph's hearts that Jesus Christ, their Redeemer, was coming to the Earth. Mary's pregnant belly was evidence enough. Yet, they also knew that it would take about nine months before He came. During that time Mary could feel Him getting bigger and stronger inside of her. She could feel Him begin to move and develop. She could feel her body change and prepare for labor, and as she rode to Bethlehem she must have known her time was close. Yet despite all these signs, she didn't know exactly what day or hour Jesus , her child, would come. All she knew was that He was coming and that His coming would be preceded by pain and suffering. And that after the pain would come a joy and a peace beyond all description. I can't help but think that Jesus's Second Coming will be much like His first. We know He will not come again as a baby, rather He will come as a resurrected being in glory and power. 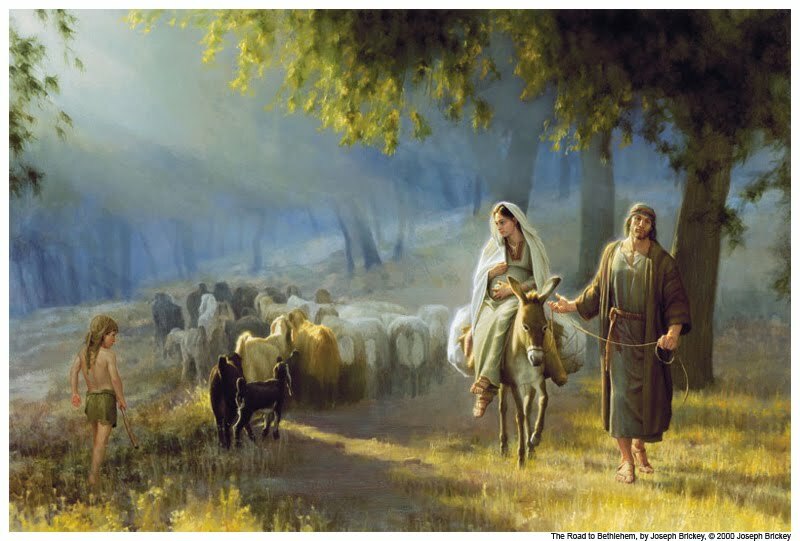 Yet just as Mary could feel and see His first coming getting closer, the righteous will know with the same certainty that His second coming is close. They will see the earth growing ripe or pregnant in preparation for His coming, and they will anticipate with joy the coming of the Son of God. They know there will be pain, even for the righteous. Yet God has promised that, just as in childbirth, the pain will be followed by the most divine and consuming joy and peace. Thank you for posting that. I couldn't have needed to hear that more. I'm 9 days away from my due date with my 2nd child and struggling hour by hour at home taking care of my sweet 21 month old recently diagnosed with leukemia and several other stresses. Just reassuring to read I guess. Thanks. Oh, Andrea you are welcome. Best wishes for this new little one and I'll send prayers your way-- it sure sounds like you guys need them. Hope all is well. Thank you Heather for this powerful post,how uplifting it is.Good news when we need to hear it. 29 And also on My menservants and on My maidservants I will pour out My Spirit in those days. Thank you Heather. This post is wonderful today. I too, have often wondered the same thing, and came to much the same conclusion, but I never put it in quite that context before. I really love how that goes together. I think you'll like this quote. "He first appeared to Mary. She didn't recognize him until he called her by name. No doubt she would have embraced him, but he said, 'Touch me not'... Maybe was the first one in mortality to know of the resurrection. A wonderful post, thank you. Oh I love this post! You have the most beautiful insights, Heather! I love this post - beautifully put. I agree that the righteous will be able to feel when the second coming is near. And I'm sure the prophet will know, too.